Covering both the design and business applications of SharePoint Designer, this complete Wrox guide brings readers thoroughly up to speed on how to use SharePoint Designer in an enterprise. You’ll learn to create and modify web pages, use CSS editing tools to modify themes, use Data View to create interactivity with SharePoint and other data, and much more. Coverage includes integration points with Visual Studio, Visio, and InfoPath. 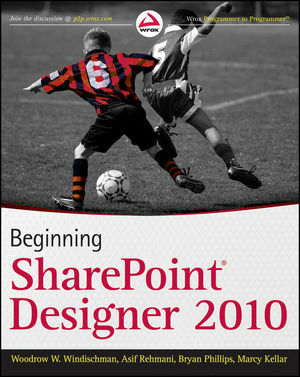 With the explosive growth in SharePoint, this book is your key to customizing your SharePoint sites with SharePoint Designer 2010. Woodrow W. Windischman is an internationally experienced IT consultant and a Microsoft MVP in SharePoint Server. Asif Rehmani is a trainer and consultant at SharePoint-Videos.com. He is a SharePoint Server MVP and MCT. Bryan Phillips is a consultant and senior partner with Composable Systems, LLC. He is a Microsoft MVP in SharePoint Services. Marcy Kellar is a user experience architect and cofounder of SharePoint Soapbox, LLC. She specializes in strategizing content and design on the SharePoint platform. 1. Using SharePoint Designer, open a site that has publishing enabled. 3. Click the Content Types tab to expose the ribbon if it is minimized/hidden. If you have not hidden your ribbon, you can ignore this step in this and future exercises). 4. Navigate to the New section of the ribbon and click Content Type. 5. In the Create a Content type dialog box, name your content type Custom Article Page. 6. Fill out the Description field. Remember, this description will be displayed whenever the user creates a new page based on this content type. 7. In the Select a parent content type section, choose the parent content type, Page Layout Content Type. 9. Create a new sorting group and name it ?Custom Page Layout Content Types?. It is a best practice to always create a new sorting group for your custom content types.